I was drawn to this recipe by its extraordinary creativity. Fergus Henderson's The Whole Beast has a handful of recipes that cry out to be made and eaten. In all my cooking I had never seen a dried, salted pig's liver, and I had to try it. The drying and curing process wasn't very different than that of making pancetta or another cured meat, but its deep red color was a vivid reminder of liver's organ status. 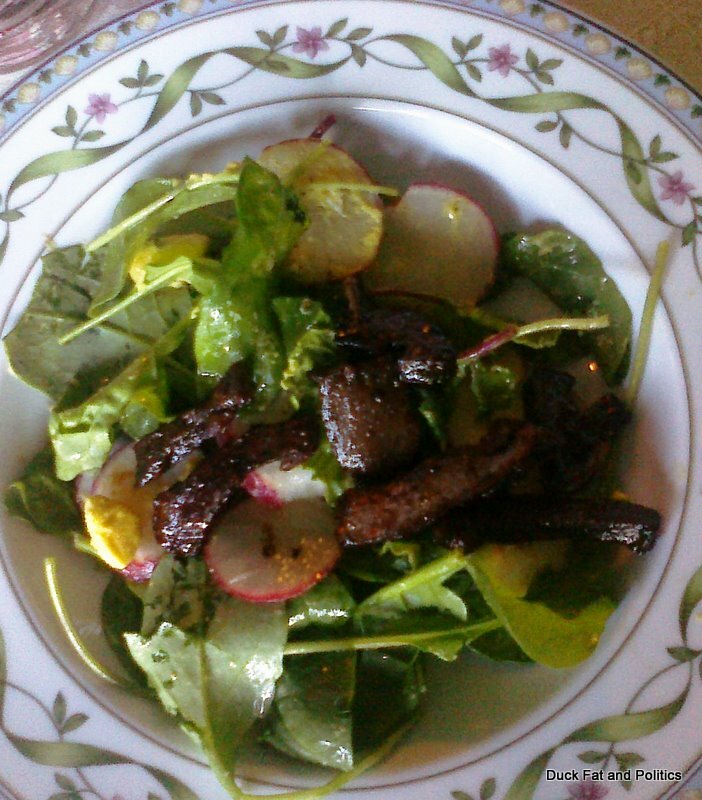 The liver has been hanging in my basement for around a month, and with my brother-in-law visiting from Toronto and tender young arugula in the garden, tonight was a perfect time to make the salad. Some of my unpicked beets from last fall overwintered well, and their new leaves were also gathered. I hard boiled eggs from the backyard and sliced the radishes, coating the whole salad with a mild vinaigrette. The liver, when cut through on the diagonal, was a deep, ruby red, dense, firm, and glossy. I never expected the texture to be so beautiful. I sauteed the liver slices in a bit of olive oil and splashed the pan with balsamic vinegar, and as soon as it was reduced I scooped the slices onto each salad, drizzling the remaining reduction on the greens. Chewy but with give, meltingly rich, the liver was fantastic; my kids gobbled up slices and asked for more. Against the snap of radishes, the spare bite of vibrant arugula, and the creaminess of backyard eggs, the liver had such deep flavor that I could barely compare its taste to other dishes. Unlike a liver pate, the dried liver concentrated its flavor with a wonderfully clean profile; the flavor didn't expand across my palate; rather, it sunk into my taste buds, penetrating the greens of the salad with a shocking earthiness - the meat equivalent of my beloved, earthborn beets. The cross-cut profile of the liver glistened like chocolate, and I'm wondering how to eat the rest of it. Fergus Henderson's salad is wonderful, and I'm sure to make it again. I also think thin shavings of liver could be used to add flavor and body to many dishes. Patrick, that's a very intriguing dish, beautifully described. I'm a big Fergus Henderson fan, too. Have you tried his raw beet and creme fraiche salad? Really good. When I read "salted pig liver" I immediately thought Chinese. Maybe try very thin slices in a garlicky, spicy dressing? Or stir-fry with some crisp Chinese celery, or fresh or pickled mustard greens? Great insight into the liver. I have collard greens in the fridge and I think they'll go well together, and I like the garlicky, spicy dressing idea. Thanks, Patrick. I am DOING IT liver always needs just a bit of salting, y'know? This will influence my chicken livers too.